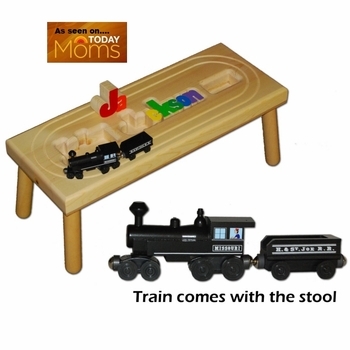 This unique wooden puzzle stool has a locomotive and coal car with a carved track and baby’s name as a colorful wooden puzzle on top! An awesome baby gift to keep the little one entertained while they learn about spelling and colors. Stands 9 inches off the ground, stool top dimensions are 9 x 24 inches. You can add another personal touch to this stool as you can engrave a message or the child's birth information on the underside of the stool. See More Images above for examples of the engraving. These make ideal gifts for newborns, birthdays or for the holidays! This is an amazing gift.....Everyone will LOVE! !